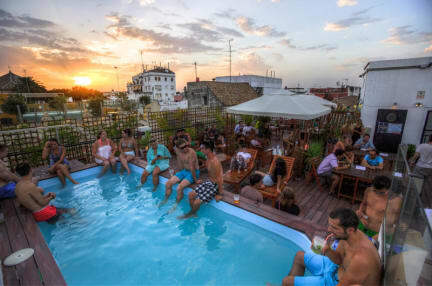 Çeviren Oasis Backpackers 'Palace Sevilla, El Corte Ingles ve Plaza de Armas yakın şehir merkezinde bulunan canlı bir hostel. Bu pansiyon havuz ve ücretsiz yürüyüş turları yanı sıra dil, dans ve yemek pişirme dersleri bir çatı terası bulunmaktadır. Böyle bir pub taramalar ve tapas tattırarak gibi popüler faaliyetleri Orada da bir sürü var. Biz bu pansiyon özel oda, daire ve Yurtlar tüm bağımsız bir iyi bir çeşitlilik sunuyor gibi. Find your Oasis in the centre of one of the most visited cities in Europe, mere metres from the Cathedral, the Alcazar palace, and the best sites for backpackers: the Alfalfa, the Alameda and the market on Calle Feria. The Palace is only 2 minutes on foot from the airport bus stop and the bus station for buses to Malaga or the beaches of Cadiz, as well as other destinations. Our rooms are spacious, more than 40 meters squared, with ensuite bathrooms, high ceilings and windows to let in the light of the city, showers with unlimited hot water thanks to our solar panels, and centralised air conditioning so you may enjoy a cool night in your bunk. Remember that we have large lockers for every bed, but bring a padlock to secure your bag inside. If you forget , you can buy a padlock at reception. Want to see the sunset by the Giralda? Go up to our roof terrace and try our mojitos or beers, see live music, or sample our BBQs and home-made Paellas. A dip in the pool and then you’re ready to hit the town - and come back whenever thanks to 24hr reception. When you wake up we have waiting breakfast if you wish, to fuel up for the day, or plan the next stop in your trip with the help of our travel desk; use our computers or WiFi to keep in touch, and leave your luggage in our storage room by reception if you still need to go shopping.